Climate change is projected to have significant impacts on most species over the coming decades, potentially resulting in increased stress, shifts in species ranges, and possibly a dramatic increase in the extinction rate. Numerous recent publications have called for strengthened conservation measures to reduce the potential negative impacts of climate change on biological diversity. There is also recognition that some traditional conservation tools, such as providing connectivity and representation analysis, need updating in response to the new challenges of climate change. On April 22, 2008 a group of conservation biologists, ecologists, land managers and representatives of environmental organizations met in Nelson, BC to explore how conservation can increase ecosystem resilience in the face of ongoing development and climate change. This project is in part a response to the needs identified in that workshop. The primary purpose of the project is to identify how appropriate land use zoning in southeastern British Columbia can contribute to meeting biological conservation goals over the coming decades (see Figure 1 below). The unique feature of this analysis is the specific inclusion of climate change considerations in the planning exercise. The approach is based on the traditional principles of conservation biology: strategically located core reserves and conservation areas, linkage zones to provide habitat connectivity between these areas, high quality matrix management to facilitate metapopulation persistence and connectivity, and the avoidance of development impacts in critical habitat. To incorporate the risks posed by climate change into the conservation design process, there was a need to compile information on potential changes that may occur as a result of climate change over the coming decades. 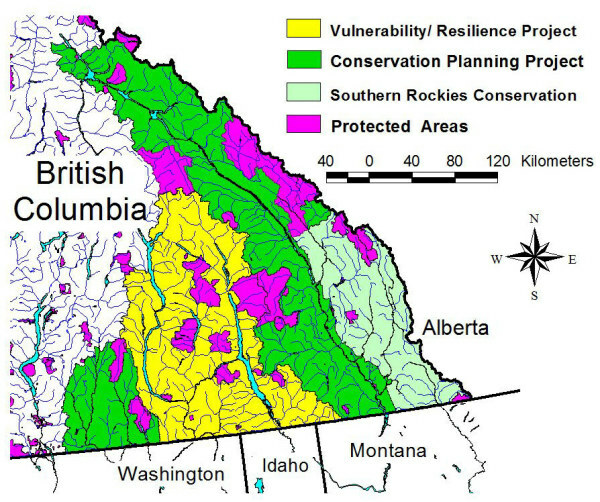 A concurrent project, the West Kootenay Ecosystem Vulnerability and Resilience Project (see other pages on this website), has provided input on the potential impacts of climate change for the region, and demonstrated the potential for substantial changes to disturbance regimes, ecosystems and key habitat components. The projected climatic changes are likely to result in range shifts for many species and local extirpations for others. This information is being incorporated into the conservation design process, such that the new conservation proposals coming out of this process will include climate change adaptation strategies, as well as meeting traditional conservation objectives. Figure 1. The dark green and yellow show the study area for this project; the yellow is the area also covered by the West Kootenay Ecosystem Vulnerability and Resilience Project (see other web page). Associated work is ongoing in the Southern Rockies region, identified in light green. The project applies both coarse and fine filter approaches in identifying critical features for inclusion in the conservation design. The coarse filter approach includes the identification of critical landscape features (e.g., mountain passes, riparian habitat), a consideration of intactness to avoid areas with extensive disturbance from past development, and representation analysis to verify inclusion of biological diversity across climatic and elevational gradients. The fine filter approach is based on habitat mapping for two umbrella species, grizzly bear and mountain caribou, as well as consideration of other key habitats such as high value ungulate winter ranges. To initiate the work, maps of current land use zoning were combined with habitat mapping for key species and examined to identify potential additions to the current conservation network. Scientists and knowledgeable local residents familiar with the study area were consulted on an ongoing basis to gather unmapped information on conservation values, and to identify additional prospective reserves, conservation areas and linkage zones based on their local knowledge. With the growing recognition of climate change as a potential driver for range shifts in a host of species, there has been renewed emphasis on managing for connectivity at multiple scales as a necessary element of climate change adaptation. Maintaining or increasing connectivity is the most widely recommended climate change adaptation measure for biodiversity, but specific recommendations for identification and management of linkage zones has been lacking. The recommended management guidelines for linkage zones aim to address this gap. Representation targets for this project have been set to reflect current scientific thinking on conservation needs in a time of rapid climate change. In a recent editorial in Conservation Biology, Noss et al. (2012) summarized scientific studies and reviews on conservation targets, and concluded that approximately 50% of a region is typically required to meet biodiversity conservation needs, with added emphasis on landscape connectivity between reserves and conservation areas. The report by Pojar (2010), A New Climate for Conservation – Nature, Carbon and Climate Change in BC, also recommends increasing core protected areas to 50% of the landbase. 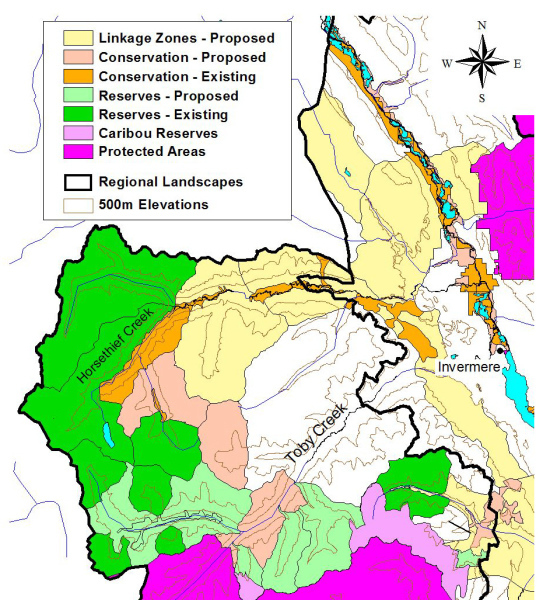 Taking that guidance into account, this project has set regional targets of 25% in core protected areas and reserves, 25% in conservation areas where restricted low impact development can occur, 25% in linkage areas with an emphasis on connectivity, and 25% with ecologically-based matrix management. This project addresses representation analysis by utilizing elevational slices of “Regional Landscapes” (RLs). Because many species assemblages and ecosystems are expected to disaggregate under new climate regimes, it has been recommended to define assessment units based on environmental factors that will remain relatively constant as climate change proceeds (i.e. enduring features). Macro topography plays a key role in determining the distribution of climate envelopes in BC, and will remain a relatively constant factor for the time scales under consideration (decades and centuries), hence the choice of topography for defining the Regional Landscapes. Draft products for the various project sub-areas will be posted to this website as they become available. These include maps, conservation value tables, management strategies, Regional Landscape summaries, a glossary of terms, and complete references. As the project progresses over the next year products will be periodically updated until the project is completed (see Figure 2 above). This work should be of use to decision-makers, land managers both private and public, and conservation organizations, in establishing conservation priorities, identifying risks, making decisions, and informing on-the-ground management strategies and actions. The project participants are keen to explore the applicability of this work with interested parties across all sectors. Conservation Northwest, Wildsight, Y2Y and Kutenai Nature Investigations Ltd. have funded various aspects of this work. The project participants gratefully acknowledge the assistance of these organizations.